The best 3 inch pneumatic polisher money can buy! Here at Autogeek we believe that if it has paint, it gets polished! Sometimes that’s easier said than done due to the small, intricate body panels that are so prevalent on modern vehicles. Say goodbye to hand polishing and waxing small body panels and say hello to the Rupes LHR75 3 Inch Pneumatic Random Orbital Polisher! This Italian-made 3 inch pneumatic polisher has what it takes to remove swirls and scratches on the most intricate body panels thanks to its massive 15 millimeter throw and compact, ergonomic design. As soon as you place the Rupes LHR75 3 Inch Pneumatic Random Orbital Polisher in your hands, you will feel the superb craftsmanship. Made in Italy by Rupes, one of Europe’s most well-known and reputable tool manufacturers, the LHR75 3 Inch Pneumatic Random Orbital Polisher was designed to get into all the hard to reach areas so every square inch of your vehicle gets polished. The massive 15 millimeter throw ensures uniform material removal so you’re left with a flawless finish every time. It may be small, but the Rupes LHR75 3 Inch Pneumatic Random Orbital Polisher packs quite a punch! Polish small panels and perform spot repair with confidence! You don’t have to sacrifice comfort in the name of quality construction! The Rupes LHR75 3 Inch Pneumatic Random Orbital Polisher continues the trend set by other Rupes power tools by offering a rugged design to compliment the machine’s superb ergonomics. If you do auto body and paint work you need this polisher. 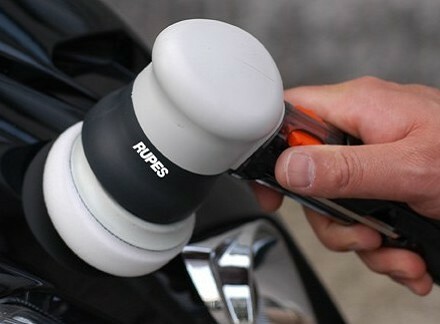 Use the Rupes pads, compounds and polishes and you can correct paint defects after painting. Small dirt nibs and runs are where this little beauty excels. You can get an interface pad and 3" sanding discs to nib out dirt and runs. Then compound and polish with the Rupes system to remove the scratches and swirls. Also works good for small curvy panels like fenders and quarter panels that have lots of body lines. Just remember that it has a very large orbit if you use it to correct paint defects with a sanding disc. Removes material fast! Very pleased with this unit!